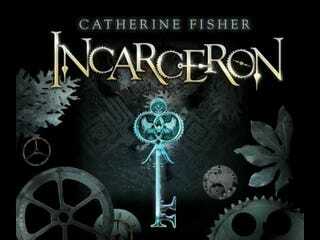 So really Incarceron is about two dystopias: The ancient prison and the fossilized society. The book has a similar structure to Scott Westerfeld's Leviathan — there are two protagonists, a boy and a girl, with the action going back and forth between the two of them. The boy, Finn, lives in Incarceron and is part of a pack of thugs who prey on the weak — but he has weird dreams and is convinced he was actually born Outside. The girl, Claudia, is the daughter of the Warden of Incarceron, and she's due to marry the odious Prince Caspar, who's stepped in to replace the original heir to the throne, the supposedly dead Prince Giles. Claudia starts to suspect that Prince Giles may not be as dead as everyone believes, just as Finn starts having weird memories about his life before he lived in Incarceron. If you can't see where that storyline is going, then you haven't read very many YA fantasy/SF books. As is de rigeur in dystopias of this type, both of our young protagonists learn to question what their elders tell them, and discover that everything they've always believed is a lie. A dark, shabby, oppressive lie. Claudia gets drawn into court intrigue as her wedding date nears, and she starts keeping secrets from her father, the Warden. And Finn leads a small group of prison rejects in search of the secret way out of the prison, guided by the legends of a quasi-saintly figure who escaped before, Sapphique, as well as a mysterious glowing key that allows him to contact the outside world. What saves Incarceron from being a bit of a paint-by-numbers fantasy about a lost Prince and a rebellious Princess is the concept of Incarceron itself — it starts out looking like your standard underground city/prison, but the more we learn about it, the more intriguing it becomes. Everyone in the outside world is taught that Incarceron is a perfect world, where society's rejects live in peace and plenty. But not surprisingly, it's a total cesspit where only the strong survive. But it gets more interesting — Incarceron is artificially intelligent, with glowing red eyes that watch all of the prisoners all the time. The prison has a spiteful personality, and it's especially pissed off that it can't observe the outside world, because its eyes only turn inwards. Also, the prison is a closed system, so nothing goes to waste. When people die, their bodies are taken away and reconstituted as something else. New people are grown or made out of the remains of old people, and some of the newer people and creatures are cybernetic: half organic, half metal. Most intriguingly, there are hints that the people the prison makes out of its dead share some memories and other traits with the people they're made out of. And one dead person's essence could be parcelled out among dozens of newly constructed people, making for a weird type of immortality. The prison literally absorbs people and then spits them out in new, often weirder forms — I'm reminded of the Remade from Perdido Street Station a bit. There's also one other giant revelation about the prison, which I won't give away here but is genuinely clever and fascinating. This place scares me. At home, I know who I am, what to do. I'm the Warden's daughter, I know where I stand. But this is a dangerous place, full of pitfalls. All my life I've known it was waiting for me, but now I'm not sure I can face it. They'll want to absorb me, make me one of them, and I won't change. I wont! I want to stay me. So the ultimate horror that both Finn and Claudia face is loss of individuality, or selfhood, at the hands of the oppressive machine. And that machine thrives on ignorance and secrets, forcing our heroes to be detectives and revealers of the truth to save themselves. It's a tried and true formula, but the weirdness and creepiness of the sentient prison elevates it to new levels. So if you, or your kids, are addicted to YA dystopias and haven't yet checked out Incarceron, it's a pretty great addition to the genre, and it shows how the genre is maturing and developing more archetypes. If you're new to YA dystopia, there are some other books you might want to check out first, including the aforementioned Hunger Games and City Of Ember.